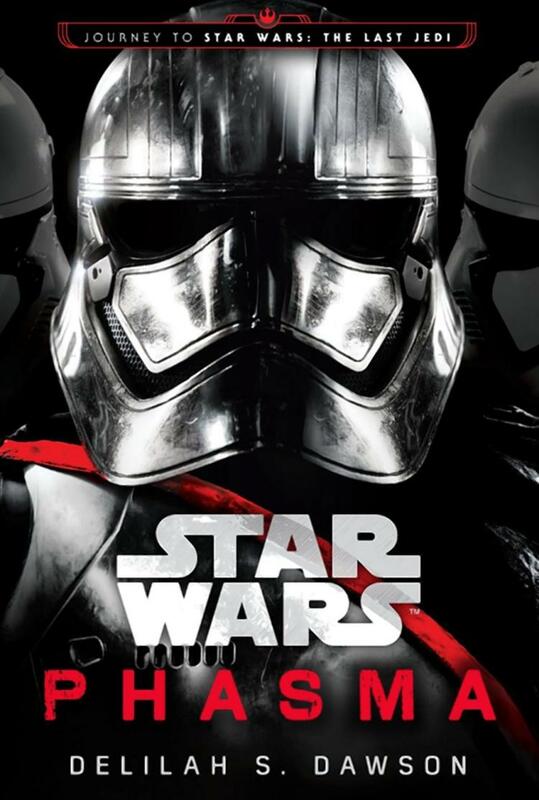 It’s safe to say that the chrome plated Captain Phasma was highly underutilized in Star Wars: The Force Awakens. Looking back on all of the hype going into the film, absolutely nothing was promised as to the importance of Phasma. Still, the plethora of merchandise in her likeness along with the fact that Brieann of Tarth herself, Gwendolyn Christie was playing the towering stormtrooper all but guaranteed this amazing new character that we never got. Force Friday II saw the initial launch for Star Wars: The Last Jedi merchandise. There were action figures, vehicles, clothing, puzzles, nerf guns, Funko Pops, and books as far as the eye could see. One of those items was one of the new canon novels written by Delilah Dawson appropriately titled, Phasma. Captain Phasma’s origin story is told in the form of an interrogation session where Resistance spy Vi Moradi has been captured by First Order captain, Cardinal. Cardinal dons crimson colored stormtrooper armor with a left captain’s cape just like Phasma. Cardinal is convinced that his highly respected and feared colleague cannot be trusted and believes Vi has the proof he needs to bring her down. Dawson’s writing keeps the reader invested throughout the story. Vi’s intel builds to its climatic reveal while simultaneously increasing the ire of Cardinal who just wants her to get to the stuff that he can use against Phasma. Dawson makes the tale feel like a long flashback sequence while seamlessly injecting reminders that it is being told from a certain point of view. The back and forth between Vi and Cardinal not only fills in the blanks about Captain Phasma but is the crux of the novel. I’m happy to report that Captain Phasma is the badass warrior that we all expected her to be. The catch is she is also ruthlessly cutthroat and will do absolutely whatever it takes to not only survive but to improve her lot in life. This explains why she so easily lowered the shields on Starkiller Base. Phasma’s desolate homeworld of Parnassos has a Mad Max: Fury Road vibe where there is trouble at every corner. Her first encounter with the First Order takes place 10 years before the events in the Force Awakens and blossoms from Phasma being an ulterior motive to a worthwhile investment. Phasma’s cutthroat nature is subtle at first but once it comes to the forefront, you realize that’s who she has always been. We also learn some cool tidbits about the character such as how she got her pronounced chrome armor and why she has an affinity for wearing masks/helmets, explaining why she yelled at Finn for taking his helmet off without permission in The Force Awakens. The character depth that Delilah S. Dawson applies to Phasma is so layered and detailed that we’re probably going to see it come to light in The Last Jedi. Gwendoline Christie and the film’s director Rian Johnson told Variety that, together, they constructed what kind of person Captain Phasma is, which means this cannon novel has to be in line with that vision. If you want to know who Captain Phasma is before heading to the theater on December 15, 2017, Delilah S. Dawson has opened the gateway to a journey that is more than worth the read. Phasma excellently executes its singular purpose while introducing new characters, elements, and back-stories, thus delivering that classic Star Wars feeling.